We have been providing Quality HVAC Work since 1976 to homeowners in the Dillsburg, Camp Hill and Mechanicsburg, PA areas (York & Cumberland County in Central PA). Our goal is not to become a larger HVAC company; for we were in the past and decided that was not the best way to serve you or us. Our mission is to give you peace of mind about the mechanical portion of your home or business. Why do we do this? Because we truly love people and want to serve them! We are satisfied with where our Creator has us in this life, and we love our work. It is not just a means to an end. We really enjoy it! And that means we will do it well. Your peace of mind now will ensure us that you will keep coming back to us in the future to continue serving you. Our goal is to give you that peace of mind. We are a family owned & operated business, and Ron Staley Sr. performs all the work himself. Most of our customers have become lifelong acquaintances and friends. The benefit of this kind of relationship is that when you call with a problem, we know who you are and the history of your equipment. With a larger company you will likely have someone working on your equipment that is not familiar with its history and idiosyncrasies, thus taking much longer to find your problem, if at all. Not so with us! Ron Staley is personally familiar with all our accounts. We are accessible to discuss your particular problem. You don't have to rely on information that might get lost through a chain of command at some larger companies. Dee Staley is the most important person in our company. 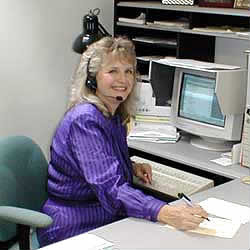 Her warm personality makes our clients feel relaxed and confident that their needs will be met. When emergencies arise, she knows the proper questions to ask our clients in order to expedite the men prepared to meet the challenge. She is also our bookkeeper and can answer questions about your account. Dee has been happily married to Ron Sr. for almost 50 years. Ron Staley, Sr. has been in the heating and cooling industry for over 40 years. He is gifted in troubleshooting and repairing a broad spectrum of equipment. 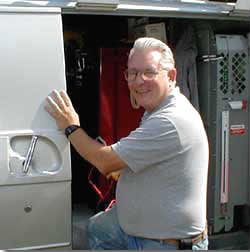 Ron has worked with most of the major heating and cooling companies in the Central Pennsylvania area. He has studied their strengths and weaknesses from the inside to learn how to best serve the public. Ron started Staley Mechanicals in 1976 to bring fresh insight into meeting your needs. Relationships formed in those early days still flourish with many of our clients, and most of them seem like family.